Co-constructed curriculum, student interest, student questions, shared inquiry help facilitate buy in from students. What stands out in Brophy’s statement is that we do not force buy in, but facilitate. Passion can only be fostered and nurtured. With a young plant, if you over water it then it will become water logged and its roots fail to take. Our challenge is to develop the right conditions then for learning. To provide support and structure where required, while also allowing the right amount of space for growth. Making sure that there is the right Ph levels and that the soil is turned over. In the end, we can only cultivate the conditions for growth and learning. This begins, as Alan Thwaites recently suggested, by doing “our best to see the way we instruct through the eyes of our students and hear how we sound through the ears of our students.” So maybe lets start there. Cultivating the Passion for Learning by Aaron Davis is licensed under a Creative Commons Attribution-ShareAlike 4.0 International License. Great post Aaron. 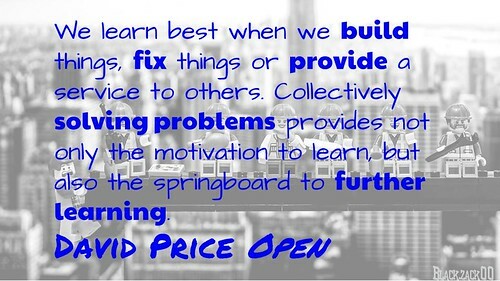 David Price’s Open has been one of my favourite books from the past year. Now reading Yong Zhou and all your comments reflect my own thinking. I want to engage my students passion, and it’s working within the restrictive curriculum for seniors that I’m trying to get there. One of the hardest issue is making tasks authentic and relevant, linked to their passions. Completely agree Jacques. I am not sure of the answer to that either. I am having enough issue with Year 9 History. There is a large amount of disengagement and as much as it frustrates me, I wonder who is really to blame. I feel that bringing in bean bags, mixing things up and providing choice are probably the starting point Jacques. Will RIchardson made the challenge at a PD day I was at last year to find 10% and start there (http://readwriterespond.com/?p=58). I think that can be a useful way of going about it. According to Daniel Pink, motivation is fueled by autonomy, mastery, and purpose. I agree with your angle here since I believe passion will drive purpose. Once again, you are giving readers something to think about and discuss. To be honest, I haven’t got to Daniel Pink’s Drive yet Robert, but am feeling I probably need to more and more. Thanks for the comment and all the continued support. I am sure I have missed something, but I have at least provided another perspective I hope.